Chinese President Xi Jinping proposed to build a "Silk Road Economic Belt," in order to enhance economic and trade cooperation between China and Central Asian countries. On September 7, 2013, during a speech made at Nazarbayev University in Astana, Kazakhstan, Chinese President Xi Jinping proposed to build a "Silk Road Economic Belt," in order to enhance economic and trade cooperation between China and Central Asian countries. The Silk Road Economic Belt together with the 21st Century Maritime Silk Road were later evolved into the Belt and Road Initiative (BRI), a bilateral and multilateral cooperative mechanism. While this piece of inland area in Central Asia, where most founding members of the Shanghai Cooperation Organization (SCO) are located, was regarded as one of the birthplaces of this China-proposed initiative. As a regional cooperation mechanism, the SCO not only focuses on cooperation on security but also on economic cooperation and is gradually expanding into people-to-people and cultural exchanges in the future. Most SCO members, observers and dialogue partners are located along the ancient silk road, providing them the geographical advantage of participating in the Belt and Road Initiative. In addition, the spirits of the two cooperation frameworks are in line with each other. The spirit embodied in the BRI – solidarity and mutual trust, equality and mutual benefit, inclusiveness, a disposition to learn from each other, and cooperation in finding win-win solutions were perfectly matched with the "Shanghai Spirit" of SCO, which also features mutual trust, mutual benefit, equality, consultation, respect for diverse civilizations and pursuit of common development. The SCO and the BRI are historically linked and natural partners that have complementary strengths, which could bring a bright future of fruitful cooperation. SCO members have shown their firm support to the BRI, expanding pragmatic cooperation, increasing the construction of infrastructure and aligning their countries own development plans with the initiative. One landmark cooperation was in May 2015, China and Russia signed a joint declaration of the connection of the Silk Road Economic Belt and the Eurasian Economic Union (EAEU). The Russia-led EAEU comprises Russia, Armenia, Belarus, Kazakhstan, and Kyrgyzstan, with an aim of encouraging regional economic integration through the free movement of goods, services and people within the union. Russian President Vladimir Putin said that Russia will work with China in paring the BRI and EAEU, citing that infrastructure development cooperation is "priceless" in general, and saying the initiative has a "global significance." China and Kazakhstan have also found common goals by synergizing the initiative and Kazakh's economic plan, known as "Nurly Zhol" (meaning "bright path"). As one of the first states in Central Asia to dock its own development strategy with the BRI, local residents and economy in Kazakhstan have benefited from the initiative via increased cross-border transport projects. During Xi's visit to Kazakhstan last year, leaders of the two countries vowed to accelerate the alignment of their countries' respective development policies and push bilateral ties to a higher level. Pakistan, though a newcomer to the SCO, has not been a stranger in the BRI. The China-Pakistan Economic Corridor, a flagship project under the initiative, has brought benefits to local residents with the completion of some projects, including construction of Port Qasim Coal-fired Power Plant and parts of Gwadar Port. The prime minister of Pakistan, Shahid Khaqan Abbasi, said recently that projects under CPEC, including road infrastructure, energy projects, and Gwadar Port would accelerate economic development and would further open Pakistan to China, Central Asia and other parts of the world. The BRI also accelerates cooperation between China and Uzbekistan, which offered the desired opportunity for Uzbekistan to improve its inter-connectivity with the outside world and play a greater role in wider regional development. The completion of the 19.2 km Qamchiq Tunnel has largely improved local connectivity, while cooperation on other projects such as the China-Central Asia gas pipeline and the China industrial park is covering various sectors including energy, transport, and chemical and high-tech. President of Uzbekistan Shavkat Mirziyoyev attended the Belt and Road Forum for International Cooperation in May last year. During the meeting with Xi, the two leaders vowed to further dovetail their development strategies and to boost economic and trade cooperation. President of the Kyrgyz Republic Almazbek Atambayev, who also attended the forum, said the BRI was "great" and will help strengthen international cooperation and mutual understanding and trust for all parties. During his official state visit to China in September last year, President of Tajikistan Emomali Rahmon reiterated the country's resolution to back the Silk Road Economic Belt, while the two sides agreed to jointly launch cross-border railway, road and natural gas pipeline projects, and explore cooperation in wind and solar energy in the future. All eyes are on the upcoming summit in the coastal city of Qingdao in northeast China. 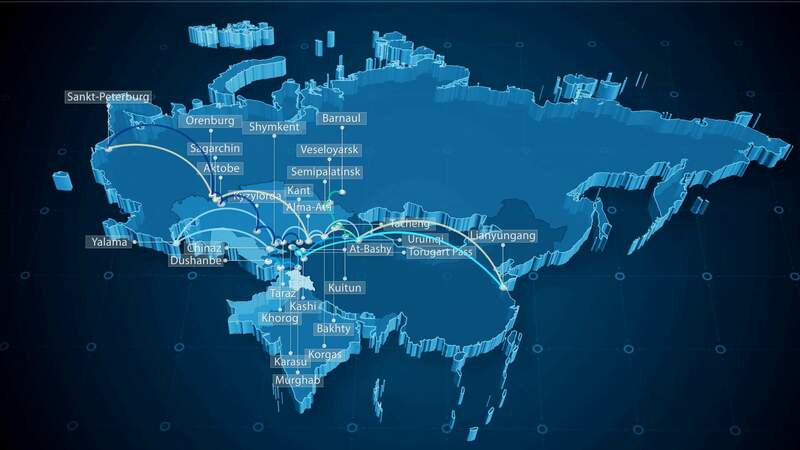 The port city, which has both land connection with Europe through railways and maritime connection with other cities, plays an important role in building the Silk Road Economic Belt and the 21st Century Maritime Silk Road. Leaders will exchange views on the current and future development of the SCO, major international and regional issues, as well as discuss cooperation in various fields to improve global governance and consolidate the multilateral trade system. "The Qingdao summit will lay out new plans to enhance the synergy of development strategies of member states, especially promoting the construction of the Belt and Road to lift regional economic cooperation," Chinese State Councilor and Foreign Minister Wang Yi said during the press briefing in May.